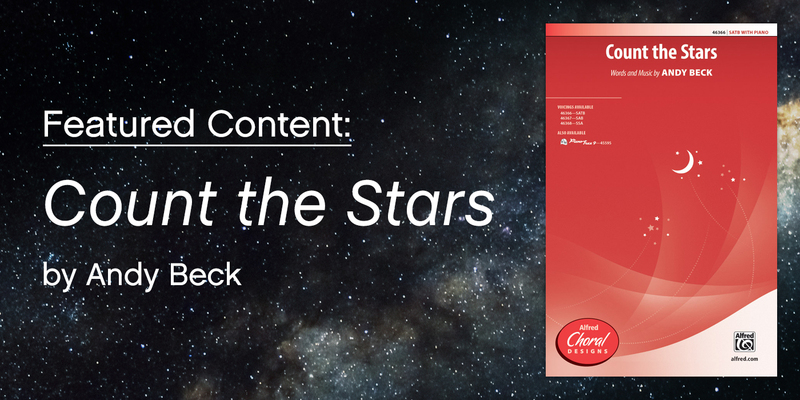 Andy Beck’s Count the Stars is a tender song of remembrance featuring a poignant original text combined with Latin phrases from the Requiem Mass. It was commissioned by a high school student’s classmates to honor his memory. With close cluster chords, beautifully sculpted phrases, and expressive dynamics, Count the Stars leaves listeners with a sense of awe and wonder. Perfect for an advanced middle school or high school choir, it’s also a personal favorite of my friend Liz Knutson (SmartMusic’s licensing coordinator) and likely to end up on state lists in the next year or two. Experience Count the Stars, and the entire SmartMusic library, for free! Discover practical music education tips, delivered directly to you! I want to subscribe to SmartMusic marketing emails. See how we use your data. New SmartMusic annual pricing starts at $4/student and $40/teacher. Find motivating music education tips in your inbox!